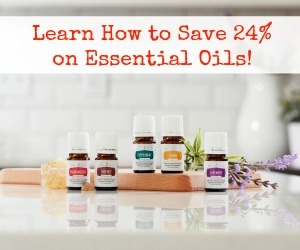 This review is long-past due. We went out several months ago with a couple of the in-laws, and took them to a recently opened restaurant on Chagrin Blvd in Moreland Hills, Flour. Flour “offers rustic Italian food,” including the traditional pasta and wood-fired pizzas, as well as a selection of house-cured meats and antipasti. As we went in, I was immediately struck by the contemporary feel. It’s very open, and definitely has an industrial vibe – cement floors, metal table-tops, and not a lot of color. Not a problem, just not what I expected from a “rustic Italian” kitchen. The food was similarly not as rustic as I expected, but still good. S selected a black pepper risotto that came topped with greens and citrus. 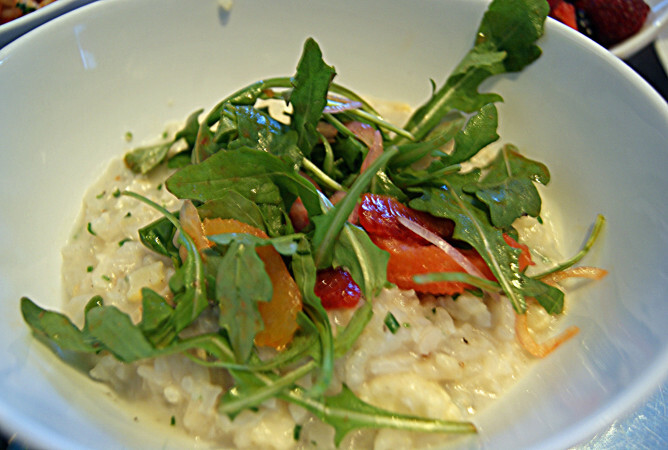 The risotto was nicely creamy, quite peppery, and balanced wonderfully by the orange and grapefruit, which kept it from being an overly heavy dish. I had a seared salmon filet, which was served over a squash puree, a mushroom and leek sautee, and topped with a rich tomato compote. Again, not exactly rustic Italian, but it was excellent. The salmon was superbly moist and delicate – if it had been cooked a minute less, it would have been sushi. 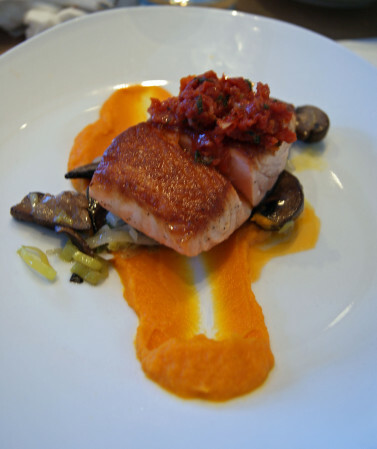 The compote was also a nice addition – one typically doesn’t think of salmon with tomato, but it worked well here. Final verdict: Flour gets 5 1/2 stars out of seven. Service was nice (they helped accommodate C with a large bowl of fruit, which he promptly devoured), prices were reasonable (though portion size was maybe a tad small for the price), and the food was very good.